An investigation is under way into the cause of a collision between a U.S. submarine and the San Diego-based warship USS New Orleans in the Strait of Hormuz in the Middle East, the Navy announced Friday. No one on the New Orleans, an amphibious transport ship, was injured in the accident, which took place Thursday around 2 p.m. Pacific Daylight Time. The surface vessel sustained a ruptured fuel tank that resulted in a spill of 25,000 gallons of marine diesel, according to a statement by the Navy's Fifth Fleet. On the submarine, the USS Hartford, 15 sailors suffered minor injuries but returned to their stations. The Navy said the sub's nuclear propulsion system was not damaged. 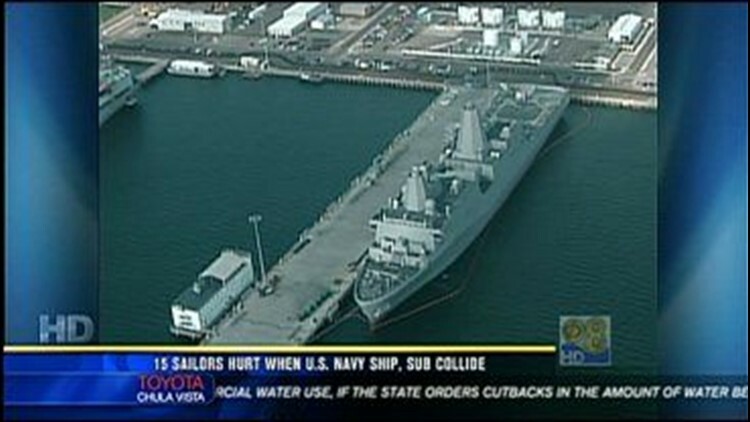 Both ships were reportedly heading to port and traveling in the same direction when they collided. The submarine was apparently submerged at the time. The vessels are conducting maritime security operations in the area, considered the world's most important shipping lane for oil tankers.